You may join the event and register here. 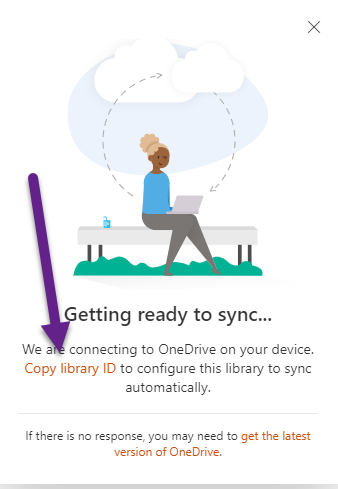 I have written an article about “OneDrive GPO: Configure team site libraries to sync automatically” and I must update this article. I have described the GPO, which is a Machine policy. 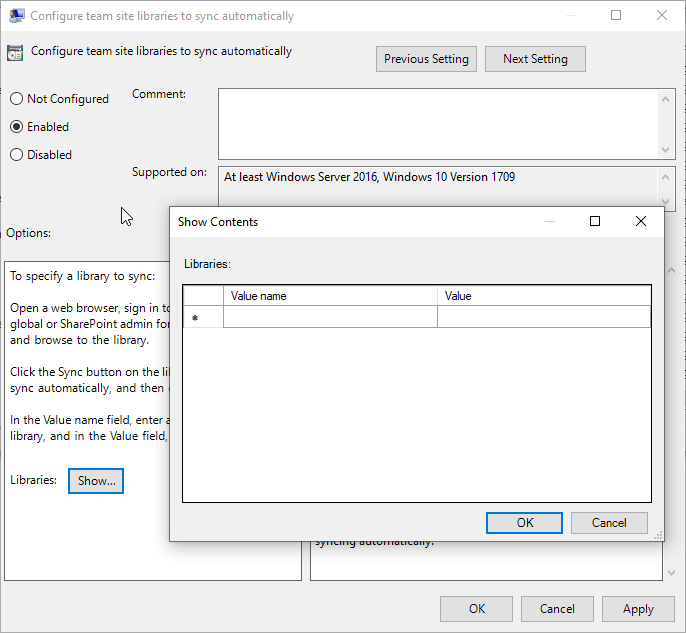 But there are other Scenario’s with more than one user and Microsoft has decided, to have the same Group Policy also in the Users Section. Why Microsoft decided to have the same Group Policy in the Users section? Its very easy, because if you look for devices, where different people from different departments will login, then there is the answer. If you have a machine policy, you are only may connect to team sites, where all possible users have the rights. Changing that to a User Policy, you may have to rollout several different GPOs, that will only work with this subset of AD. Why do we have the limit of 1000 devices? A change occurs in Office 365. 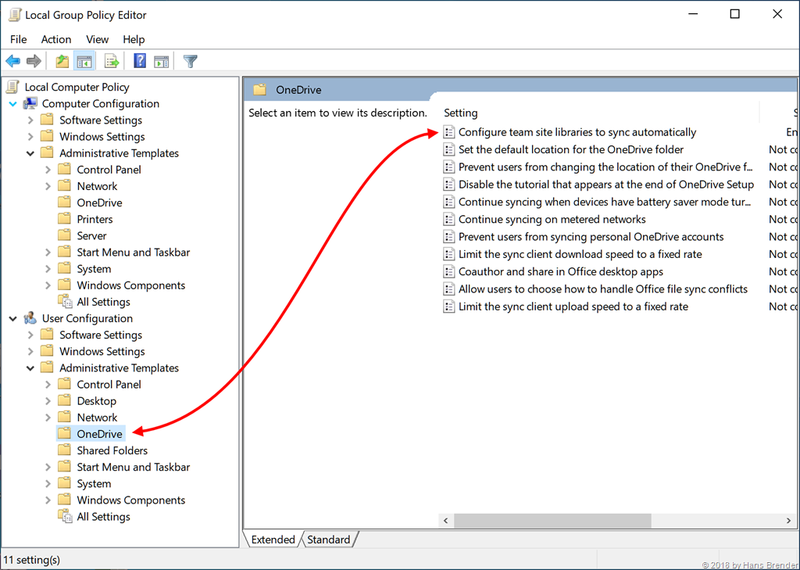 WNS alerts the OneDrive sync client of the change. OneDrive adds it to the Internal Server Changes Queue. – Any metadata changes happen immediately, like renaming or deleting files. – Downloading content also starts a specific session with the client. 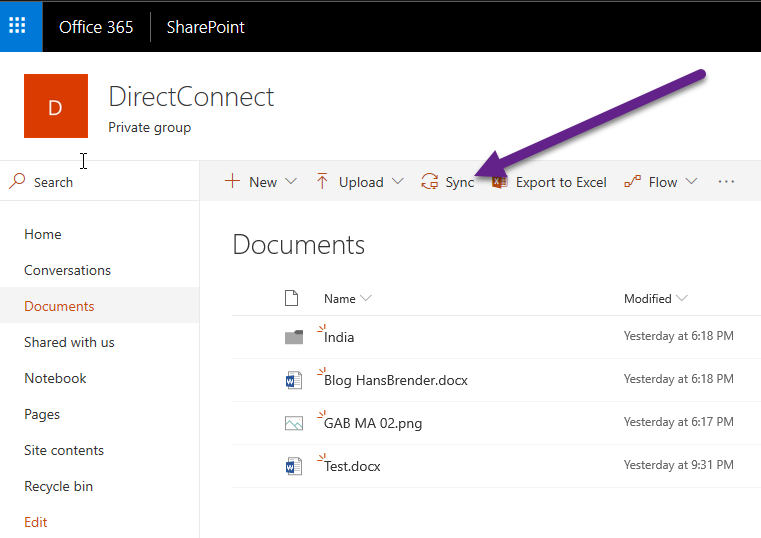 Office 365 has metadata pointers directing it through Microsoft Azure. The changes are processed in the order they are received. 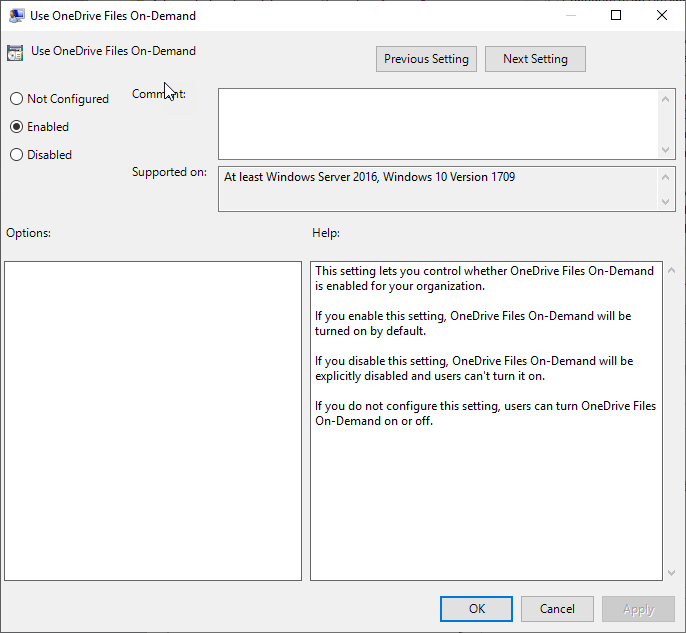 The previous OneDrive for Business sync client (Groove.exe) used a polling service to check for changes on a predetermined schedule. Polling can lead to system lag and slowness because it requires a lot of computing power. Using WNS is a significant enhancement. Now back to our question: WNS has one limit: 1000. This is the current limit of devices that can subscribe through the WNS pipeline to get notifications from the service about file changes. After that limit is reached, the remaining clients will go into polling mode, which means they will poll the service every few minutes to see if there are any changes. Why does take up to 8 hours, until the client machine receives the files? This is because of the potential spike of requests of mounting a team site both on the customer’s network as well as on the backend service. 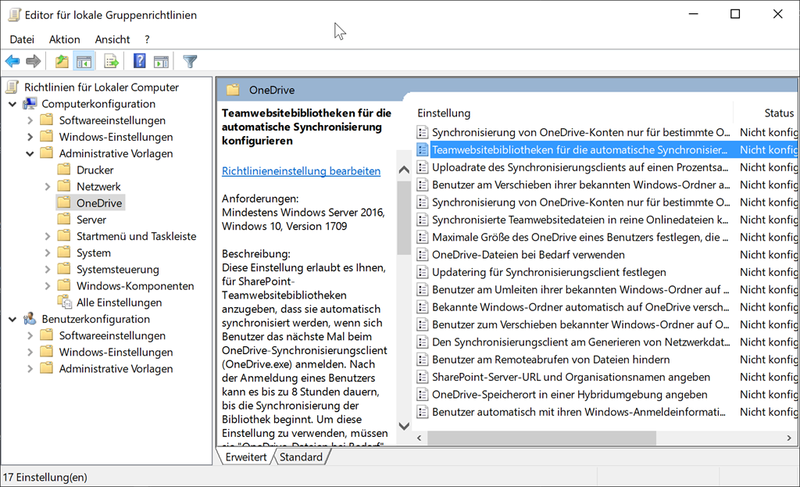 Für den Next Generation Sync Client (OneDrive.exe) hat Microsoft verschiedene Gruppenrichtlinien veröffentlicht. Eine davon ist für Firmen, bei dem automatisch eine oder mehrere Dokumentenbibliotheken von verschieden Seiten automatisch verbunden und der Inhalt synchronisiert werden soll. Das kling nicht nur interessant, es eröffnet auch neue Möglichkeiten. Aber was im nachstehenden Artikel beschrieben wird, zeigt auch die derzeitigen Limitierungen auf. Zuerst sollten Sie die sich die Gruppenrichtlinie Konfigurieren von Team-Websitebibliotheken für die automatische Synchronisierung genau ansehen. Oder aber die englische Version davon. Diesen Artikel gibt es auch in englischer Sprache. 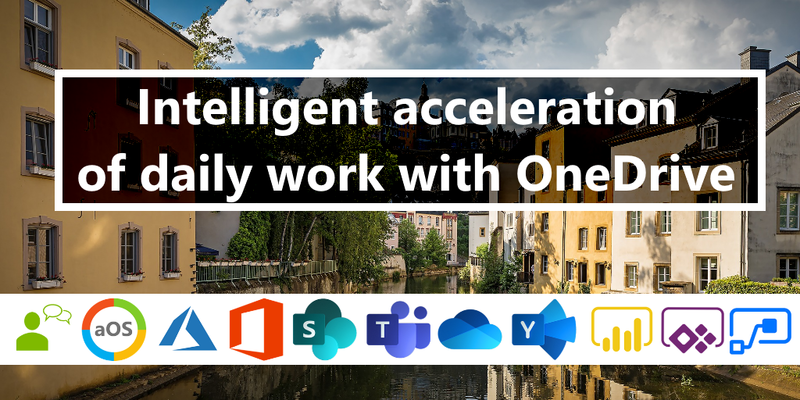 OneDrive adml and admx files installiert. Zur Zeit kann diese Gruppenrichtlinie nur benutzt werden, wenn Sie auf diesem gerät auch eine Windows Insider installiert haben oder Office Insider sind. 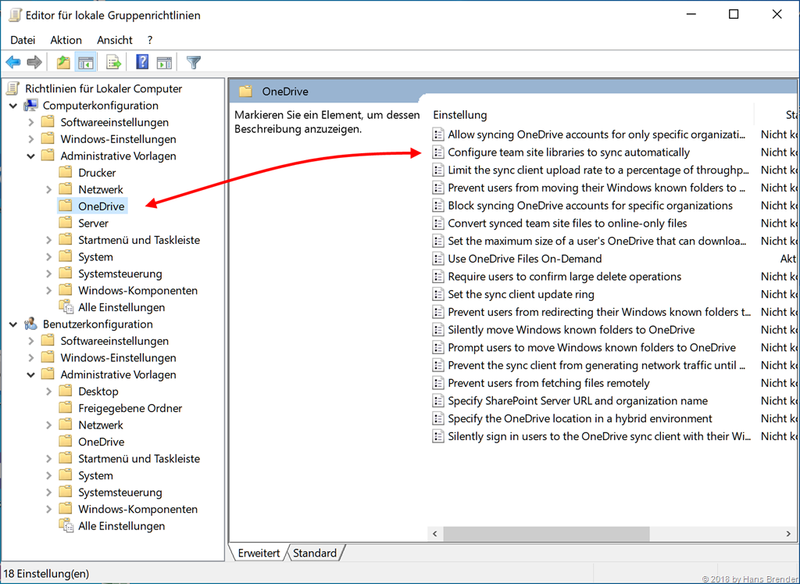 Dies hat nichts damit zu tun, dass Sie auf der Maschine die OneDrive.exe aus dem Insiders Ring installiert ist. Um Die SharePoint Online Library ID zu bekommen, wird bei mir das Pop-Up unter Edge nicht immer angezeigt. Ich bin dann auf Chrome ausgewichen. 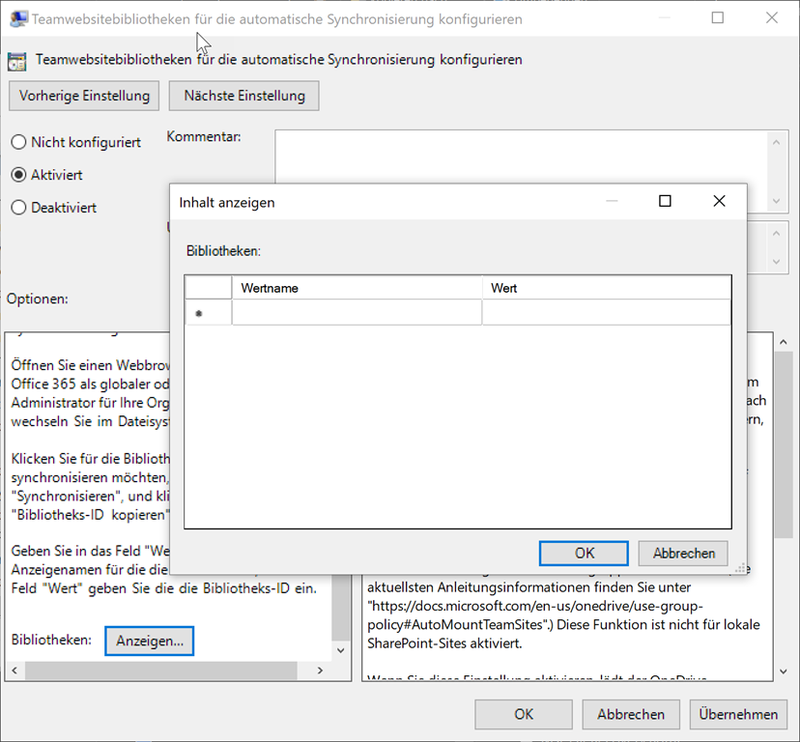 In ihrem Artikel schreibt Microsoft zur Gruppenrichtlinie Konfigurieren von Team-Websitebibliotheken für die automatische Synchronisierung, dass nicht mehr als 1000 Geräte hinzugefügt werden können. Ich denke, für manche Szenarien ist dieses Limit viel zu gering. Ich denke an Mittelstands- oder Enterprise Kunden, die mehr als 1000 Mitarbeiter (Geräte) haben. Hier fällt mir spontan ein Onboarding Szenario ein, bei der die Personal-Abteilung auf Ihrer Website alle wesentlichen internen Formulare und weitere Dokumente bereitstellt. Für dieses Szenario, neuer Mitarbeiter erhält neues Gerät, wird dann automatisch mit dieser Teamseite verbunden und die Dokumente synchronisiert, ohne Platz auf dem Rechner zu beanspruchen. Aber das Limit von 1000 Geräten verhindert das. Ein anderer Punkt ist die lange Zeit. Es kann bis zu 8 Stunden dauern, nachdem der Benutzer sich eingeloggt hat, bis diese Gruppenrichtlinie wirkt. Dann macht obiges Szenario auch keinen Sinn. Bitte Microsoft, hebt diese Einschränkung auf. 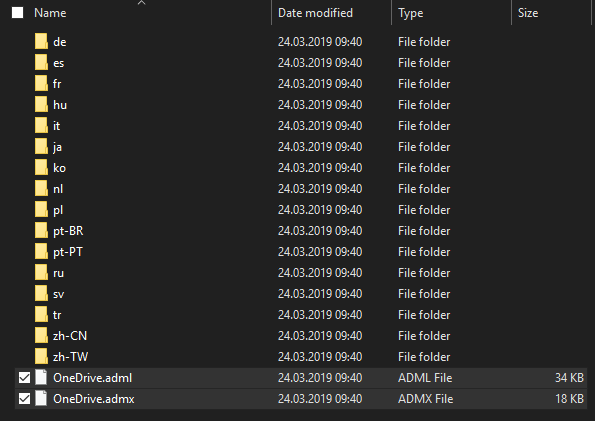 Dort sind nicht nur die zwei Dateien (Onedrive.adml und OneDrive.admx) in englischer Sprache enthalten, auch andere 16 Sprachen sind dort enthalten. Dann auf den Link geklickt. Nichts passiert. Aber trotzdem ist die komplette Library in die Zwischenablage kopiert worden. 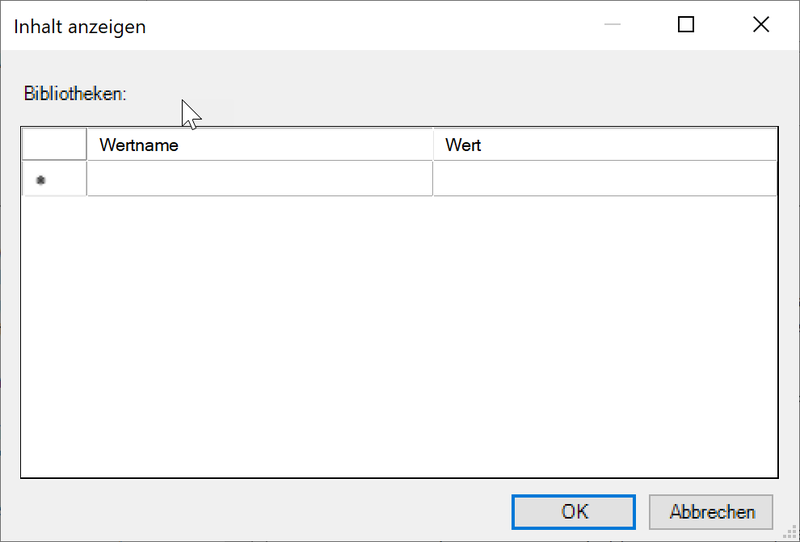 und wir sehen, es sind mehrere Teil-IDs vorhanden: TenantiD, siteId, WebId, ListID und die webURL. “Teamwebsitebibliotheken für die Automatische Synchronisierung konfigurieren” auswählen, aktivieren und dann auf Anzeigen klicken. Wert Name: Hier muss eine für Sie erkennbarer Name eingetragen werden, damit Sie die Library identifizieren können, denn hier können auch mehrere Werte stehen. Wert: Hier wird der in der Zwischenablage gespeicherte Library ID eingetragen. Danach zweimal auf OK drücken um die Gruppenrichtlinie zu aktivieren. 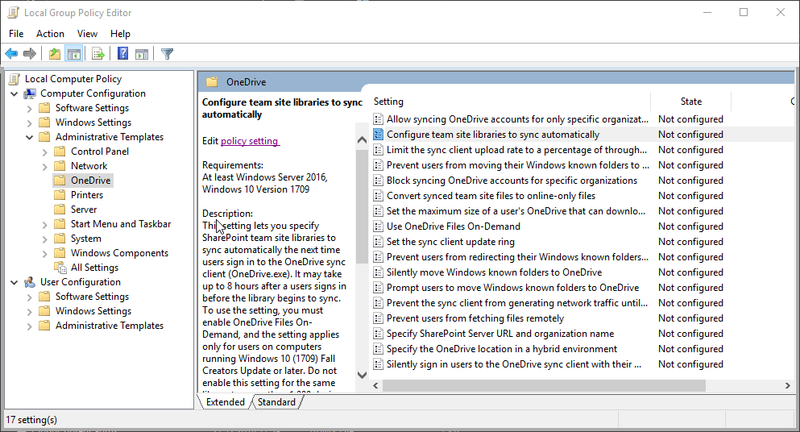 For the Next Generation Sync Client (OneDrive.exe) Microsoft has created several group policies. One of them is for companies, so we may automatically connect with a document library. This can be interesting, but people asked me, they have no success with this group policy. Thinking for Midsize or Enterprise Organizations: The Onboarding process could be more easily, if we connect the sync client automatically with let’s say HR team site. So here is a good starting point for “all employees”, where all important documents a reside. The new Employee have nothing to do. 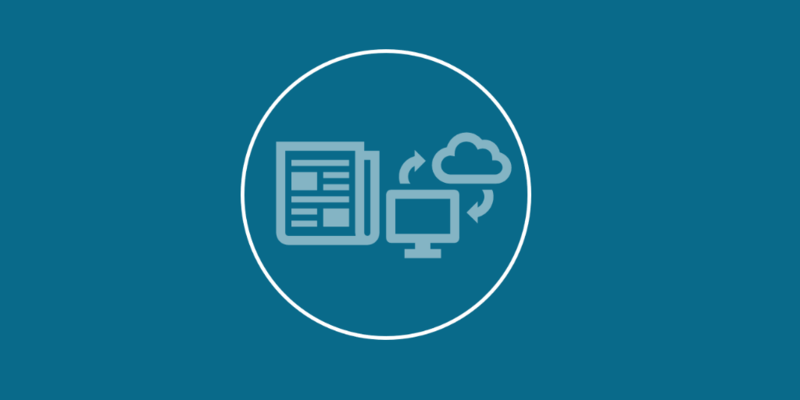 It’s on his machine, takes no space (Files on demand), and if documents are updated form HR people, all employees will sync the docs automatically, but only if there are not more then 1000 devices, connect to this document libraries of other Sites automatically. you see, there is the TenantiD, siteId, WebId, ListID and webURL. 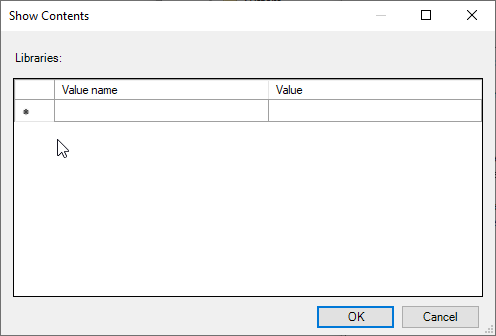 Value name: Here you must enter a friendly name, that you are able to identify the library, because here you may insert more document libraries in other sites, and you must identify them. Press two times OK to enable the GPO. Reboot your machine and wait up to 8 hours. I have waited 2 hours and then automatically I found a new library and all files are displayed as Cloud Only. 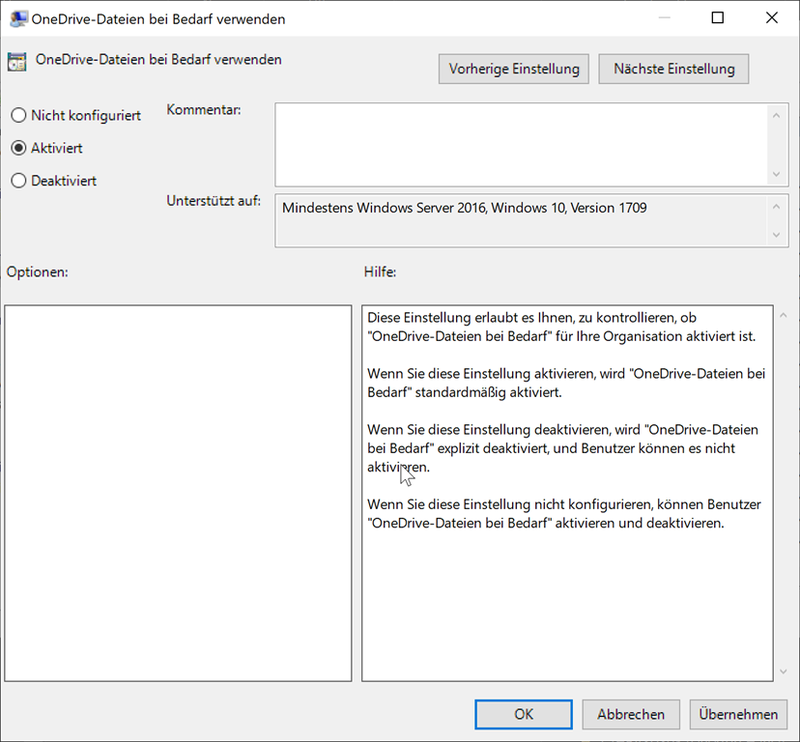 Microsoft hat mit der neuen OneDrive Version 19.002.0107.0008 neue Gruppenrichtlinien veröffentlicht, aber auch bestehende mit neuem Namen versehen und damit die Definitionen neu erstellt. Wenn Sie Ihre Gruppenrichtlinie nicht finden, dann wurde der Name nicht geändert. It’s amazing. So many speakers are on this event, and I’m proud to speak also there. 70+ Microsoft MVPs, 14+ Microsoft Regional Directors will present their knowledge to the community. 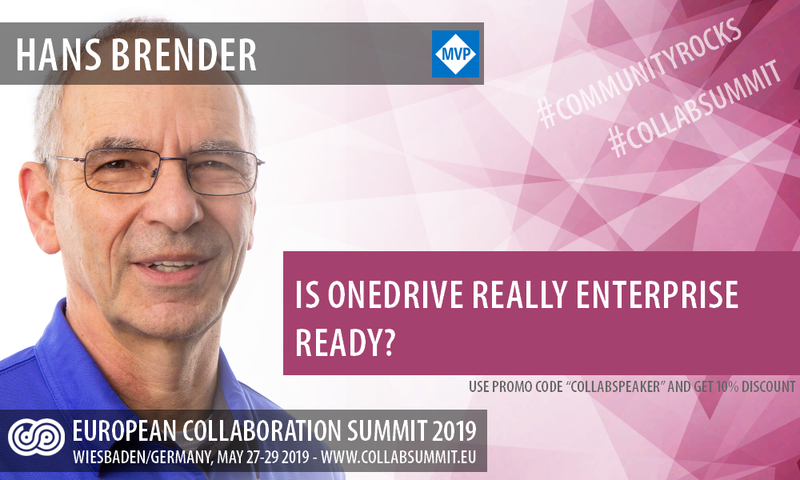 Register at www.collabsummit.eu and use the promocode “COLLABSPEAKER” and get 10% Discount. Is OneDrive Really enterprise ready?